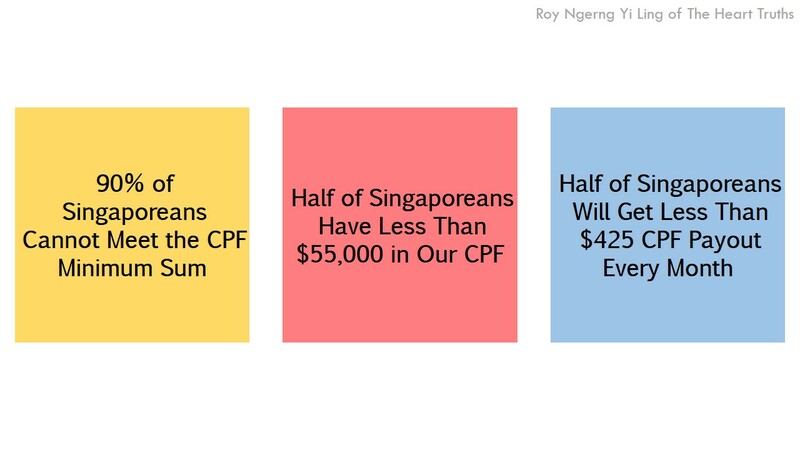 Two weeks ago, I wrote about how I had calculated that the median CPF balance that Singaporeans would have is about $55,000. 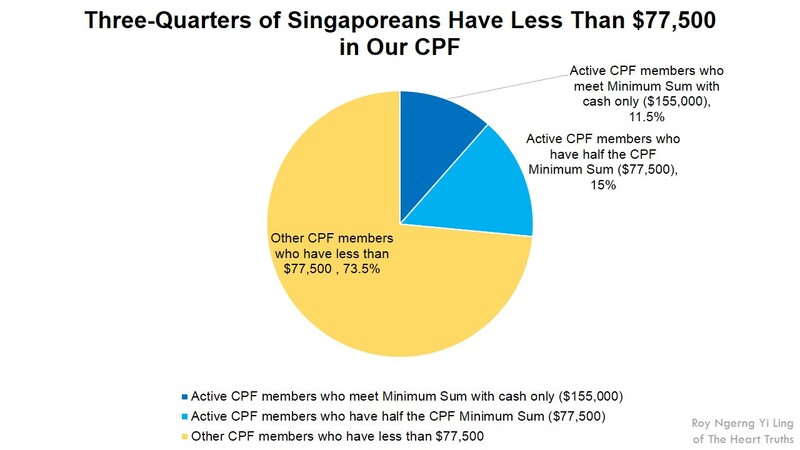 This means that half of Singaporeans have less than $55,000 inside our CPF. 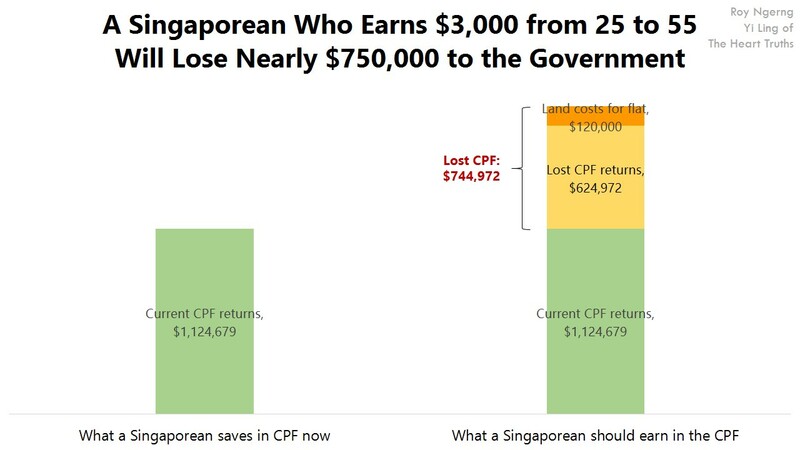 In fact, I calculated that 73.5% of Singaporeans would have less than $77,500 inside our CPF. 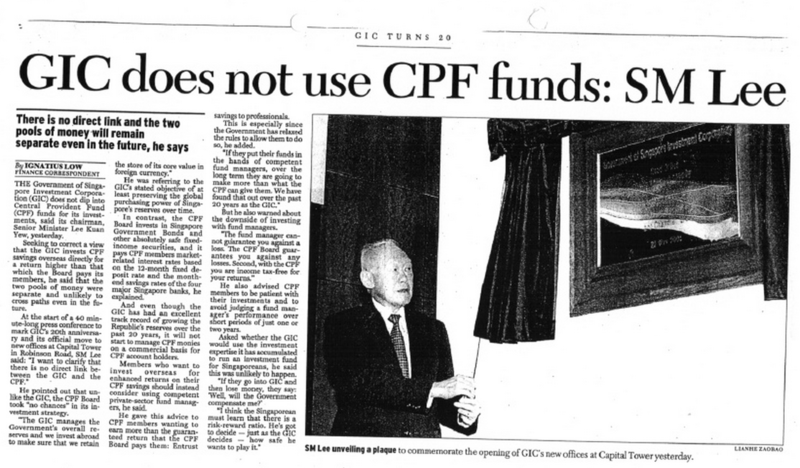 I had thus written about how even though the government knows that the majority of Singaporeans simply do not have enough inside our CPF to meet the CPF Minimum Sum, they kept increasing this Minimum Sum since the mid-1990s! Why would the government keep increasing the CPF Minimum Sum to trap Singaporeans’ CPF inside and not let Singaporeans withdraw our money? 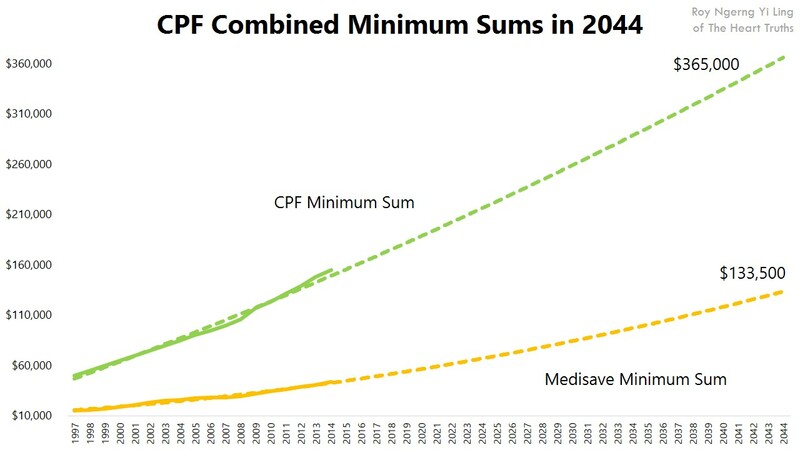 On Tuesday, I wrote that the CPF and Medisave Minimum Sums are expected to increase to $498,000 in 30 years’ time in 2044, at their current rate of growth. 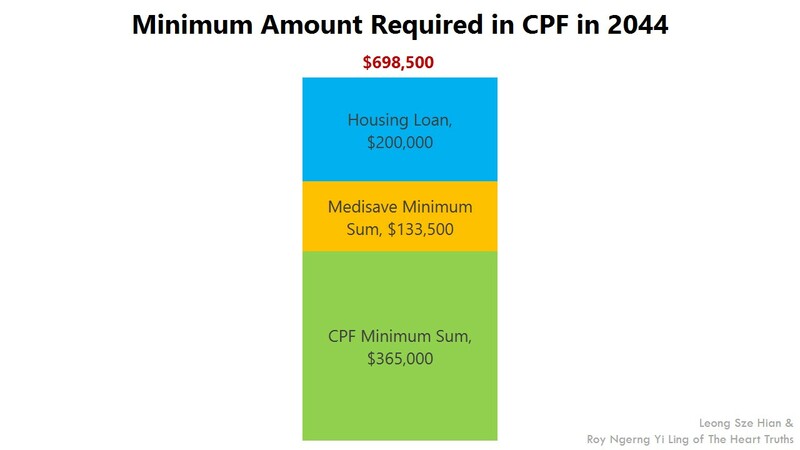 (You need to have enough inside your CPF to meet both the CPF and Medisave Minimum Sums before the government allows you to withdraw your CPF). 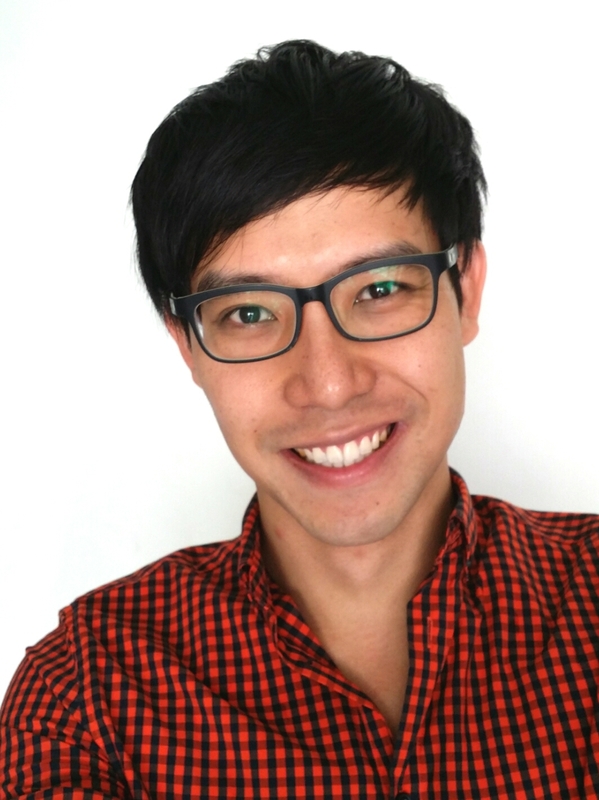 And so, in order for Singaporeans who are starting work today to be able to retire in 30 years’ time, we would need to meet not only the CPF and Medisave Minimum Sum, we would also need to have enough to pay for housing loans – or about $200,000 each for a couple who buys a flat at the average price of $300,000 today. In total, a Singaporean would need to have nearly $700,000 inside our CPF to be able to retire. Today, a Singaporean earns an average of 3% on our CPF (2.5% on the Ordinary Account and 4.5% on the Special and Medisave Accounts). 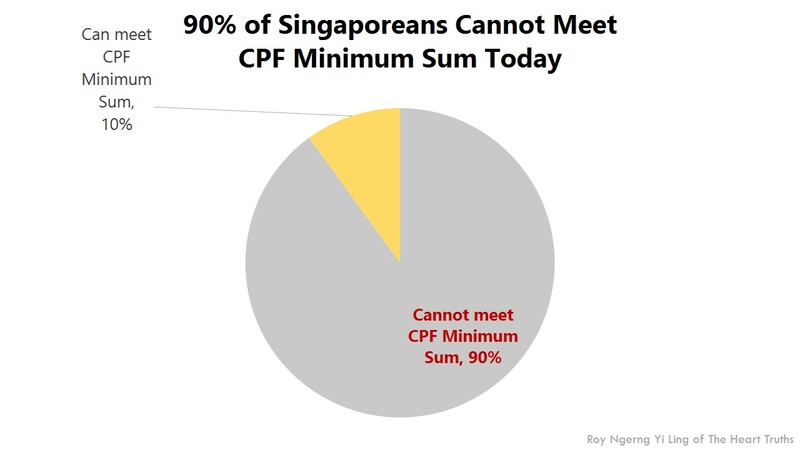 And because of this, it is estimated that 90% of Singaporeans are not able to meet the CPF Minimum Sum of $155,000 today. In June this year, the government finally admitted that they take our CPF to invest in the GIC. This is after many denials. Lee Kuan Yew denied this in 2001 and 2006. Then-Manpower Minister Ng Eng Hen denied this in 2007. Now, the GIC earns an estimated 6% since inception and if the 6% is rightfully returned to Singaporeans, we would have a higher chance of meeting the CPF Minimum Sum. 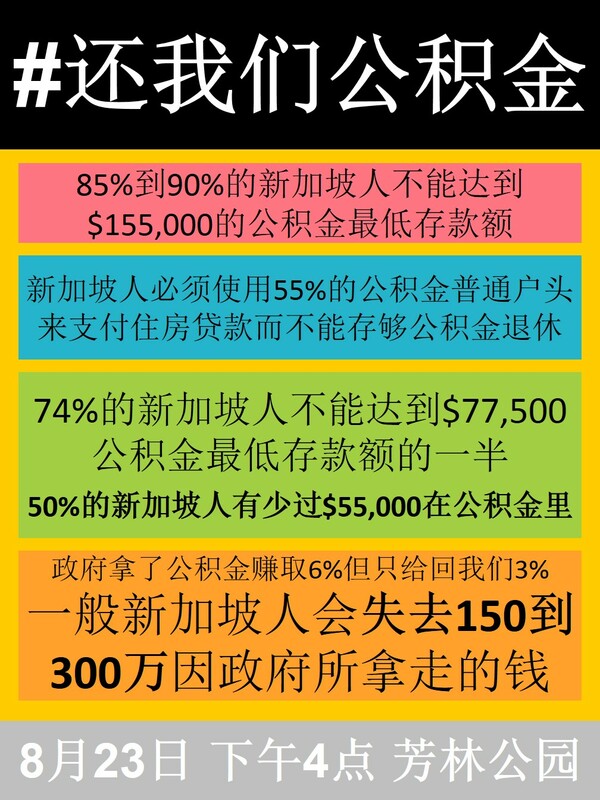 Yesterday, I wrote about how because we are not getting the additional 3 percentage points interest back, the average Singaporean who works from 25 to 55 would be losing nearly $750,000 from our CPF (or nearly half of what we should earn on our CPF). And the average Singaporean who works from 21 to 65 would lose nearly $3 million! 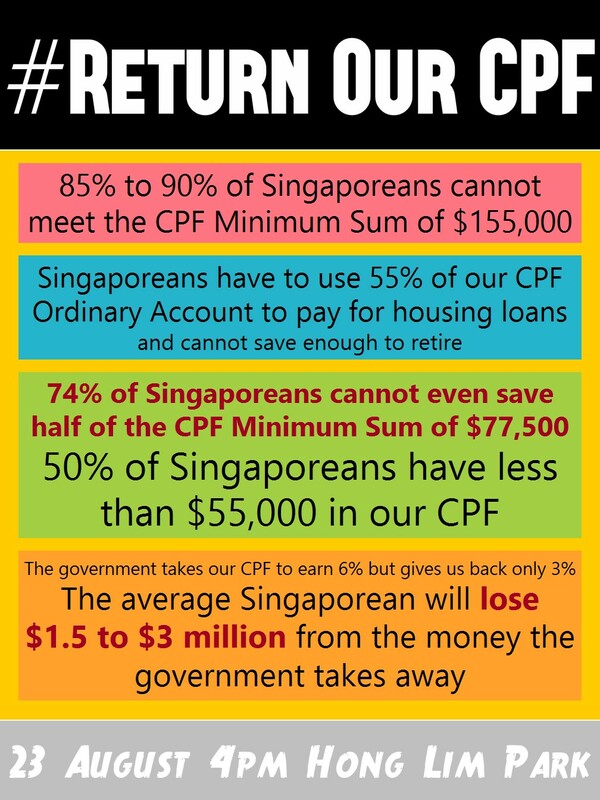 Very clearly, if Singaporeans are returned the 6% interest that we are rightfully earning on our CPF, the majority of Singaporeans would be able to save enough inside our CPF to meet the CPF Minimum Sum and be able to retire. So, the question now is – why is the government taking our money away and not returning it back to us? The government takes away as much as half of what we would have otherwise been able to save! Why doesn’t the government want Singaporeans to retire? 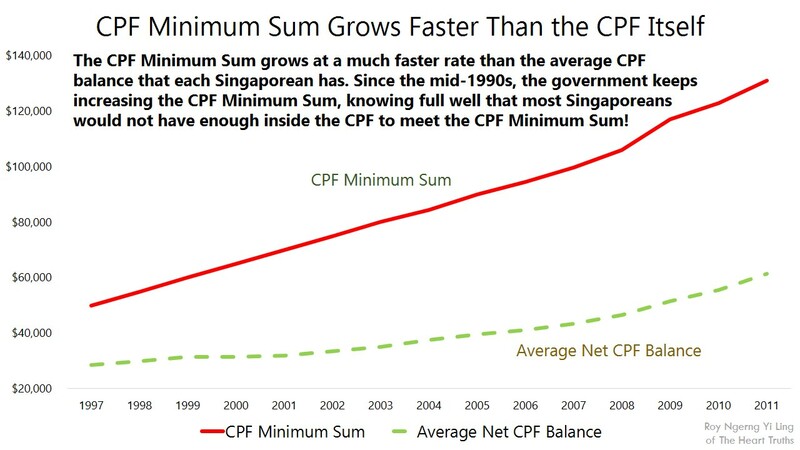 Why does the government keep increasing the CPF Minimum Sum to trap our CPF inside? 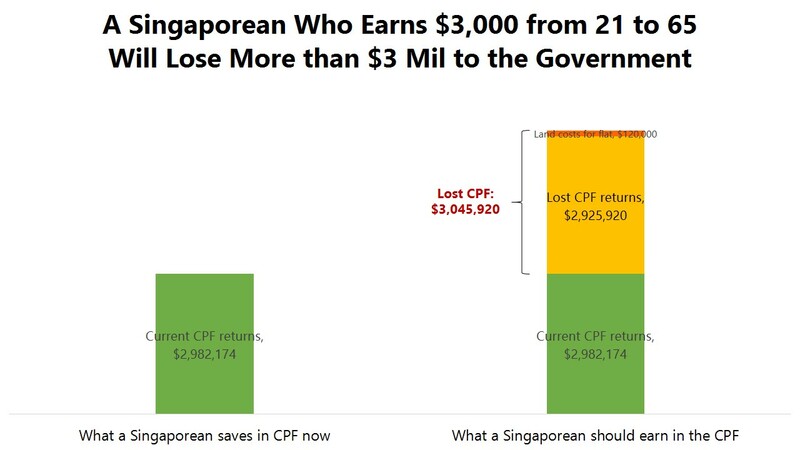 Why does the government not return the 6% interest to Singaporeans and prevent our CPF from growing? Is this what a responsible government should be doing? What is the aim of the PAP government? What is their real agenda? Don’t you think something is amiss here? ISN’T this what a responsible Govt should be doing? The word enough is the same as RICH. 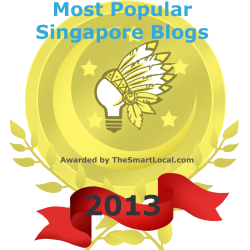 We Singapore will have enough to retire comfortably as most have a roof over their head. Eat what is needed and not what you wanted and go PUBLIC as LKY likes you to do. The COE is designed to tell the not rich but act rich people to buy a car so he can have 5Cs. We are born with 2, our legs which is also CARS, right? As long as you are Healthy & Happy, there is nothing call NOT ENOUGH. When you are Healthy you save on Medical and Doctor’s fee and are FREE of worries and that means you will be HAPPY. Visit http://www.idragon111.com can help you achieve Healthy & Happy LIFE 4ever. Why does Roy just want RETURN OF CPF. 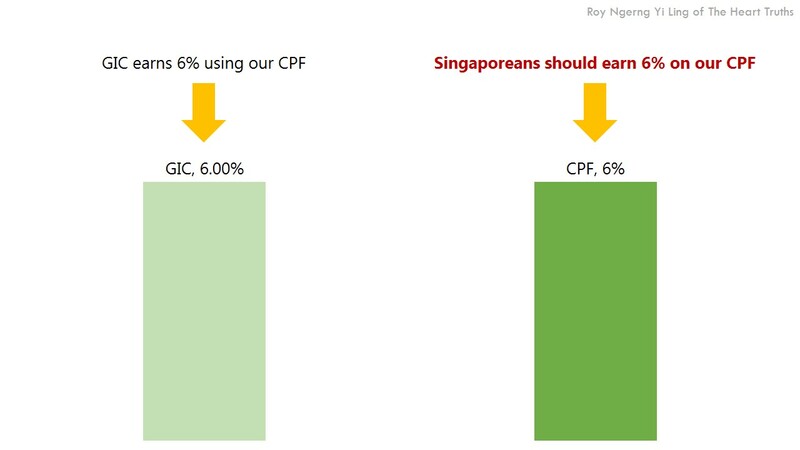 Roy write about how to invest the CPF to earn better than the 3%. If I spend all my CPF then I will eran 0 %.